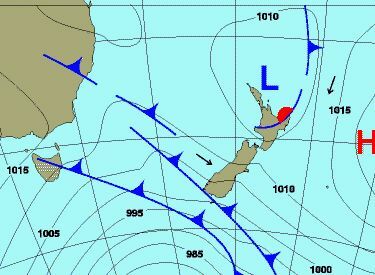 The Southern Alps both attract and help create bad weather. Overall the mountains are colder, wetter and windier than other places. Arthur's Pass is often victim of a "Nor-wester", a weather pattern that brings torrential rain to the West Coast and over the main divide, then roars down the Canterbury Plains as a hot, dry wind. Average annual rainfall in the village is 4500mm. (180 inches). Away from the moderating influence of the sea, temperatures in the mountains range between greater extremes than they do on the coastal lowlands. Consequently you need to be prepared to add or subtract garments more frequently than you might elsewhere.